"He says he respects our moral position, but not our execution. Also, he says he's never talking to us again." When our heroes make a stand for free speech and allow a racist stand-up performance on campus, all their e-mails are leaked on the internet. 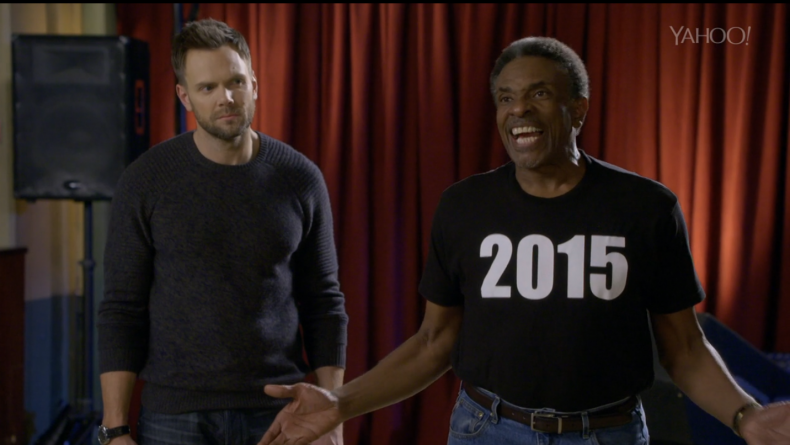 Community has never shied away from self-mockery, so in addition to the usual meta-references to the state of the show as 'new faces' are pointed out (I wish they would stop doing that, it got old years ago), this episode also pokes fun at the Sony e-mail leak from late 2014 that affected the show's producers, Sony, as well as Joel McHale. This episode also references ongoing debates about whether or not anyone should be banned from speaking on a college campus, and thus does one of my favourite things for Community to do - address actual issues relating to (community) college! (I'm just biased because I work in a university). This is a good episode for Britta, whose ideals are actually treated with respect here. She goes about things in sometimes ludicrous ways, but she sticks up for what she believes in, backed up here by Annie, whose facial expressions during the anti-Semitic part of Gupta Gupti Gupta's act are priceless. The fact there's a genuine dilemma between standing up for free speech and protesting offensive material is interesting as well, though everyone (understandably) seems to come down on the side of free speech fairly easily. Abed points out towards the end that this is the third time the group have ended up getting upset about the revelation of secrets and dirty laundry, identifying the Annie's Pen Incident as the first. The second I had thought might be the puppet episode from the gas leak year, though the first fake clip show could also count - and Frankie's reference to it happening after Troy left and Pierce died suggests something from season five, and I'm actually not sure which one they're referring to there. I'm not sure referencing a critically praised episode from what Abed actually refers to as 'the golden years' plus some much later, less universally beloved material is a terribly good idea, as the main thing it achieves is to remind everyone they'd rather be watching 'Cooperative Calligraphy' - though I am enjoying Frankie's constant, doomed attempts to catch up with everything that went on before she arrived. Taken by itself, this episode is one of those stories that's just kinda there - there's nothing terribly offensive in it (apart from the deliberately offensive stand-up act, of course) and nothing really awful, but nothing that stands out as classic Community either. On the plus side, there are no gimmicks, spoofs (the tag aside) or extended fantasy sequences in it, and while I love those, it's good to see the show embrace more realistic storylines too. - It's fun to see Officer Cackowski again, and I enjoyed the True Detective rip-off with his (very) junior partner at the end, even if children in the police force is a step a little too far outside reality for my taste (yes, I had this problem with much of the back half of season three as well!). - Is it my imagination or are everyone's laptops Macbooks with the Apple logo covered up? This is why I really don't mind product placement - it's less distracting to me than hiding identifying labels in bizarre ways! - I always love seeing Neil, but I kinda wish they hadn't done that to him. My heart broke a little at the expression on his face. 'Advanced Dungeons and Dragons' means a lot to me, it was the first episode I ever saw. Elroy (to the Dean): Did you forget your password again? Cause I can't keep up with all the parakeets you had growing up. Officer Cackowski: Avengers? Avengers? Avengers? I hear Marvel got really hands-on this time, they really penned Joss Whedon in creatively, so how can that go wrong? Britta: We're the colony so high maintenance the British gave us up! We're so obnoxious the French sent us a statue! Abed: Chang was our teacher. Stop reminding me you're not quite as good as you used to be, show, and I'll enjoy you more. Two and a half out of four leaked e-mails. I'm pretty sure the Season 5 episode referred to is Cooperative Polygraphy, in which many ugly secrets are revealed through Pierce's post-mortum machinations. I agree with you about some of the more heavy-handed meta elements of this season. Thanks willaful, that makes sense - I hadn't thought about the fact that was the episode when Troy *decided* to go away, which I guess is what Frankie was referring to? (And he went away because Pierce died and stipulated it in his will, so yeah, that all fits). That was a good one, actually. Actually I think it's supposed to be a sequel to both Cooperative Calligraphy and Polygraphy, sort of making it a trilogy. If that's the case, considering how fantastic those two are, it's a shame they didn't manage to stick the landing. The issue is that the study group no longer feel like a family. They've lost the warmth and love they had for each other when Troy, Shirley and yes, even Pierce were there. While that kind of is the theme of the season, it has the unfortunate consequence of the show not being as enjoyable as it used to. Despite all that the show still is very funny and the actors are all on terrific form. It's just a shame that the show doesn't quite have the heart it used to.